There is a castle in Inverness, too. 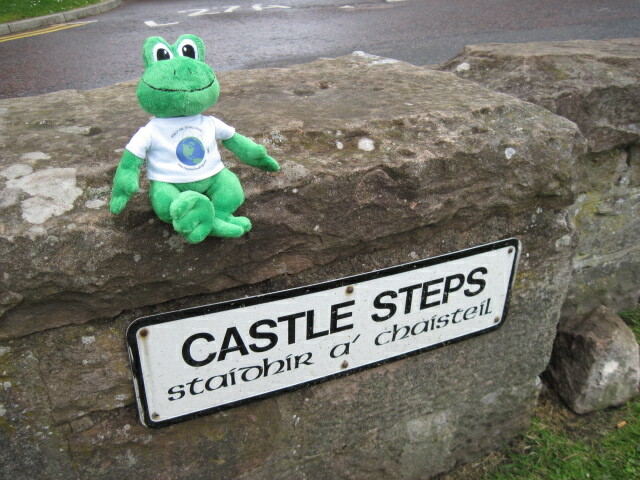 There are castles everywhere in Scotland! Is this a lily pad? 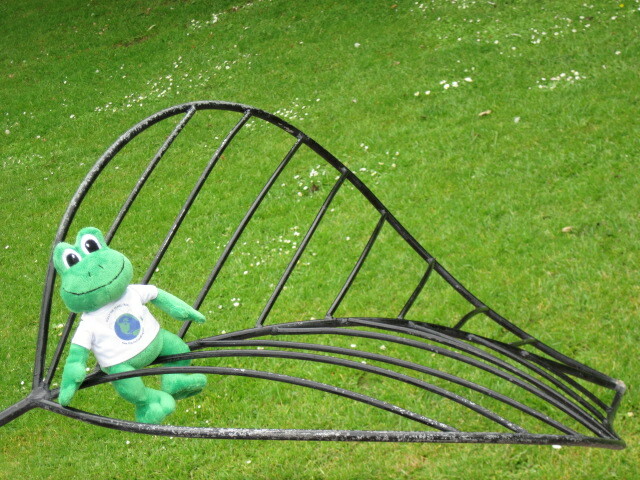 I found this near the River Ness, in Inverness. It looked like it was made just for me. 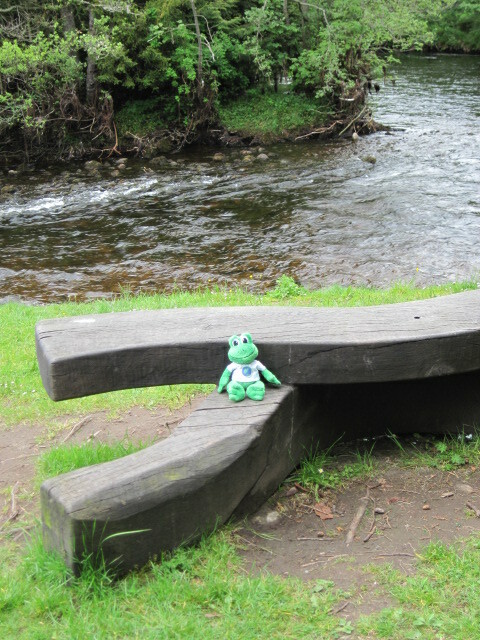 Here I am, relaxing along the Ness River. So beautiful . 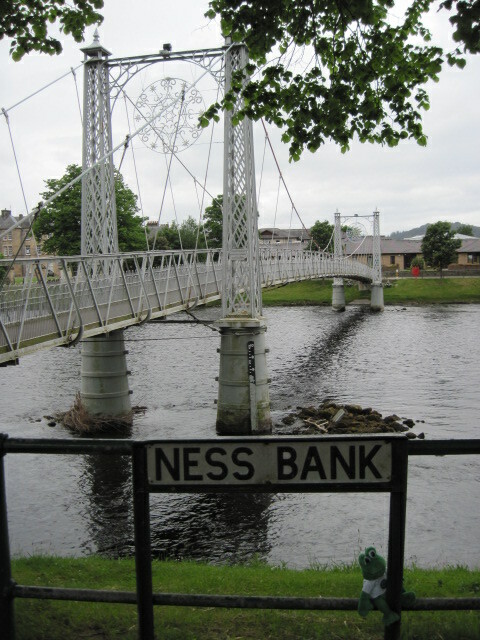 . .
Me, on the River Ness, in the town of Inverness. 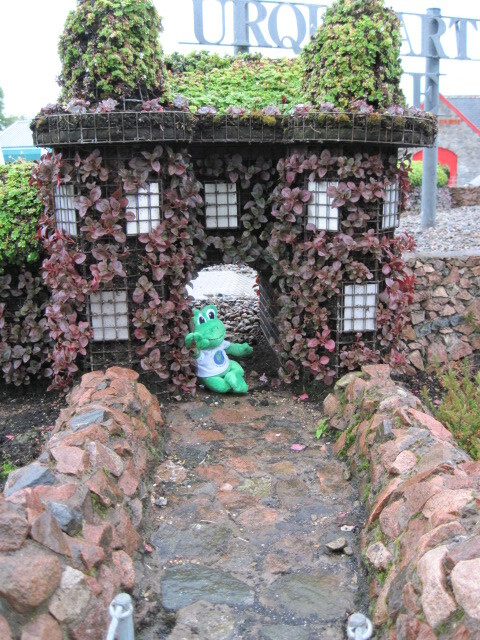 There is a real castle in Drumnadrochit and this is a frog-sized replica of it -- made out of flowers! 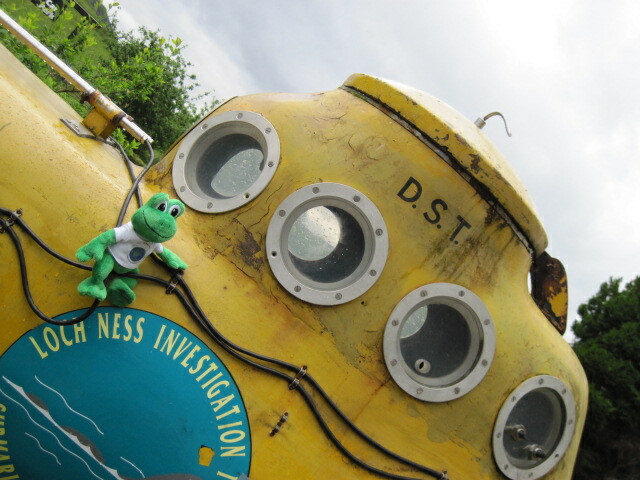 An American named Dan Scott Taylor brought this yellow submarine to Loch Ness in 1969 to try to look for the Loch Ness Monster. This sub leaked around the hatch and didn't have headlights, so he had a very hard time finding what he was looking for. The submarine sat in a warehouse in the U.S. for a long time and is now permanently located in Drumnadrochit. 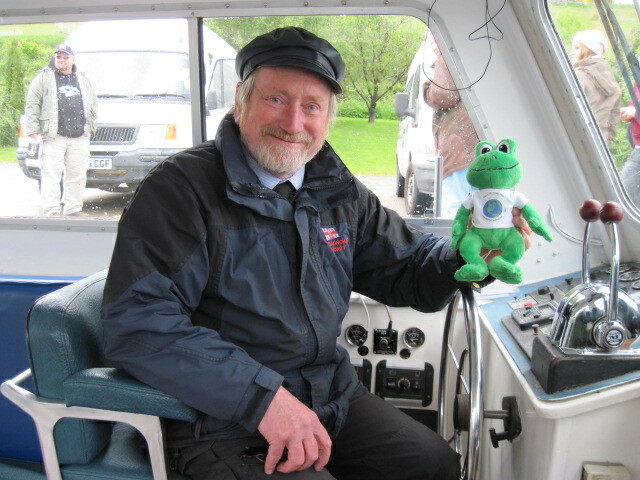 This is the captain of the boat which took me out on Loch Ness to try to find Nessie. He has been looking for Nessie for over 40 years and has never seen her. I was just sure that we'd find her together, but we didn't. Maybe next time. 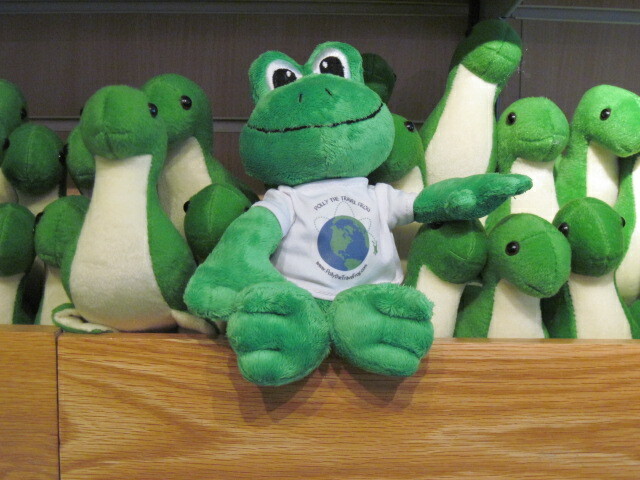 It's very hard to see Nessie, but you can always buy her in the gift shops! Have you ever seen so many green friends in one place? 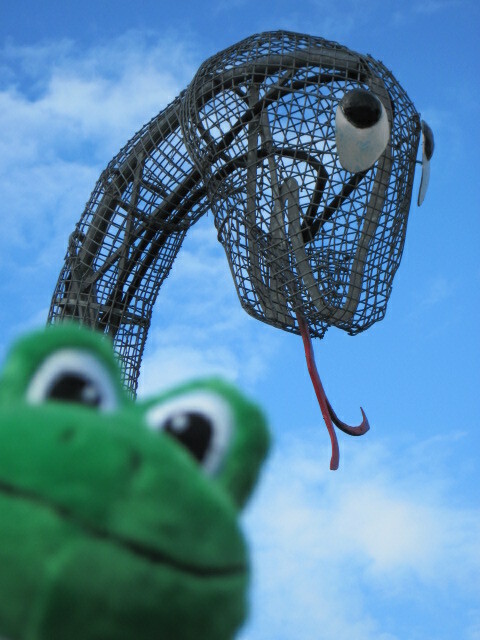 What is Nessie doing on dry land? I found her by the canal in Fort Augustus, but she was dry as a bone. The Captain looks really familiar. I think I’ve seen him on some of those monster shows on the Discovery Channel–or whatever channel it is. Good stuff!